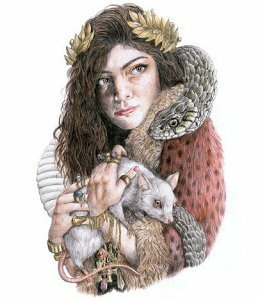 Dear Lorde, What's With The Dog, Snake & Rat? No, we're not referring to the Chinese New Year, but sometimes auspicious images can add to the mystique of a budding career, particularly in this digital age of viral-over-night-sensations. We've all seen them blossom out of no-where, ignited by a cyberventilating YouTube video. Logically, they're unlikely rags-to-riches tales, the likes of a pubescent 12 year-old or a middle-aged Scottish volunteer church worker. This year, into that stratosphere sails the melodious tones of a young New Zealand waif some are comparing to Adele, but with much more of an old-soul's edginess, uncommon for a youth who comes to fame at 16 years of age. Born Ella Yelich O'Connor, the young artist has chosen the pseudonym "Lorde" because she likes the idea of slipping into 'character' when she performs. Some say she considered Duke, but was turned off because it sounded too masculine (and of course, Prince was already taken). "Lorde is like a character, something I can switch on and switch off when I'm on stage," she explains. So What's With The Snake & Rat? So is Lorde a 'pet lover' or the victim of well-crafted publicity campaign? Surely if one was to examine her one and only album cover, one might question motives. In a campaign to hype her full-bodied vocals and lyrics that belies the singer's age, it was Lorde's belief she would let her voice proceed her true physical identity which she chose to keep a secret for months after her songs went viral in New Zealand. The only visual representation she was willing to release was an artist's rendering of a Boa constrictor wrapped around her neck, holding a rat (or possibly a possum) in her hands. On June 14, she became the first artist in her country to simultaneously have four songs in the top 40, which came off her freshman album, "The Love Club." The lead pop hit, "Royals" is now getting airplay around the world and according to Billboard and Nielsen SoundScan, it is the first song by a solo female artist to hit the top 10 of the alternative-music charts in the U.S. since 1997, when Fiona Apple's "Criminal" tipped the No. 4 spot. Lorde is now currently working on a full-length version of that album slated for release Sept. 30. “Royals” is a swoopy, thumping take-down of today's infatutation with fame and the name-dropping rejection of designer brands and celebrity extravagances. So What's With The Dog? 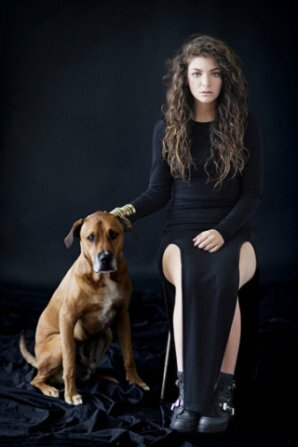 It's perhaps a little odd that a young independent-thinking celebrity like Lorde who held her identity a secret for so long, would be prompted to take a publicity photo with a dog to promote her "Royals" single. Ms. O'Connor explained the juxtaposition of artist and dog this way: "I was fascinated with aristocracy and royal families - especially their family portraits. The type of photos where they are all sitting (up) straight, looking awkward with their animals around them and a sheaf of wheat or something sitting there strangely representing their farm or whatever. "I wanted a big dog - so asked the photographer and he had a stylist friend who brought one in. I hope it doesn't look too awkward ..."
No, not awkward Lorde, but here's hoping you are truly a pet lover and haven't already become jaded at the ripe old of age of 16, using animals as mere props? Nah, that's the tactics used by much more seasoned artists! Oh Lord! Here Boy! Fetch My Keys!